Hair comprises of three layers, Cuticle, Cortex and Medulla. Cortex contains 75 – 80% of hair’s protein structure giving hair it’s colour, strength and elasticity. CSF is a revolutionary breakthrough formulation that directly nourishes and fortifies the cortex. How Does VLCC Aroma Hair Strengthening Oil Work. 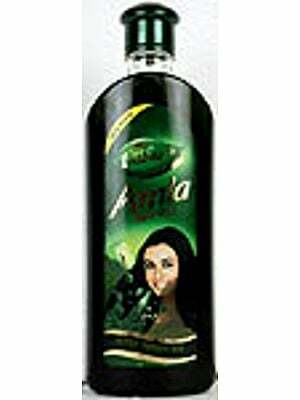 VLCC Aroma Hair Strengthening Oil comes enriched with CSF (Cortex Strengthening Formula). CSF helps to increase the Keratin Formulation in the hair, giving it strength, elasticity and prevents immature hair graying. Eclipta Alba & Musk Root helps restore the normal hair growth cycle by nourishing and strengthening hair follicles. Rosemary, Orange & Sesame oils help in getting rid of the dandruff problem and prevents hair fall. Olive oil & Almond Oil has extraordinary hair repair and protection formula and help in stimulation blood circulation, fight hair infection and conditioning the damaged hair giving you relief from split ends problem. See Visible results in 4 weeks. Aroma hair strengthening oil may not prevent hair fall in genetic baldness disorders. Directions: Take appropriate amount and apply all over the scalp & hair in length using fingertips. Ingredients: Almond Oil 10%, Orange Oil 1%, Eclipto Alba Ext. 1%, Forest Flame Ext. 1%, Musk Root Ext. 1%, Indian Pennywort Ext. 1%, Lavender Oil 1%, Rosemary Oil 0.8%, Sesame Oil 12%, Olive Oil (Q.S.). An Ayurvedic Product (For External Use Only).